Learn how one organization with Polycom voice devices and Microsoft Office 365 realized a 109% risk-adjusted ROI and benefits of $1.6M over three years. Learn more about the business benefits and cost savings attributed to Polycom voice solutions for Microsoft Office 365. 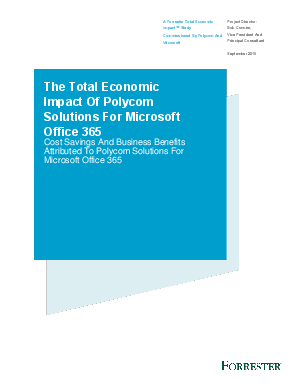 The Total Economic Impact Of Polycom Solutions For Microsoft Office 365, a commissioned September 2016 study conducted by Forrester Consulting on behalf of Polycom and Microsoft.